So here’s the deal. You’re 6’5″ and you want a folding bike (because getting commuter trains with a normal bike can be a fairly miserable experience). But most folders—at least, the sort designed for use on commuter trains—don’t really work well for people that tall. I had a Dahon once, and although it was a good bike and great value, it just didn’t fit very well, and that put me off folders for quite some time. But I think I’ve got a solution now. 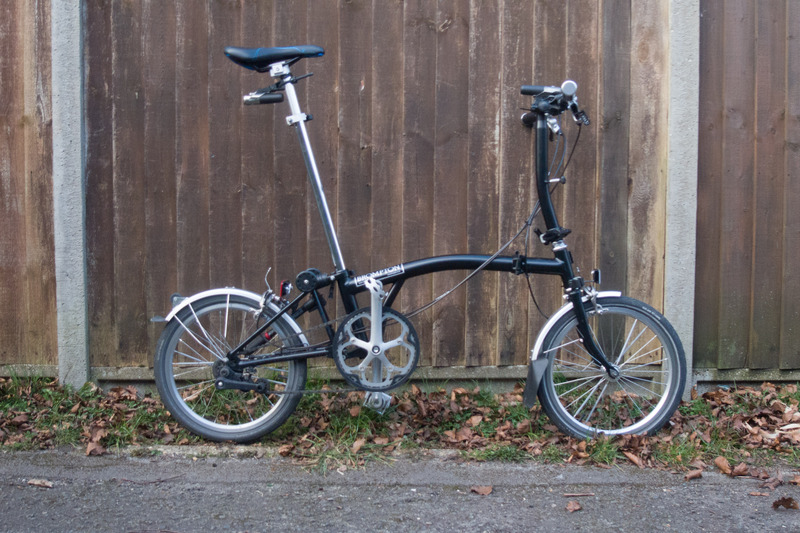 Starting with a secondhand Brompton S2L, I’ve made three or small easy and relatively inexpensive changes that add up to enough of a change in dimensions to transform the way it rides. First up, the easiest bit: the saddle and saddle clamp. The biggest issue I had with my old Dahon was that the saddle wasn’t far enough behind the bottom bracket: I couldn’t get anywhere near the amount of layback that I wanted, and I constantly felt I was pushing the pedals backwards more than downwards. Not ideal. 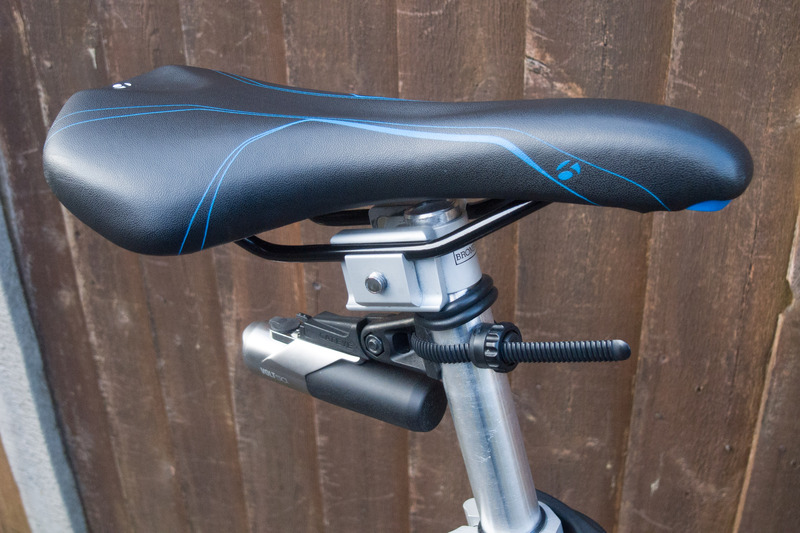 Bromptons have a slightly different saddle setup: notably, you’ll normally see them with the saddle quite for forward on its clamp, because this reduces the size of the fold. But fortunately the saddle clamp (the Pentaclip, as it’s called) can be spun round to extend rearwards, instantly giving a few more inches of layback. And then, swapping the stock saddle for one which has longer rails gives just a little more. Hey presto, an acceptable position. Of course, the next place to look is the front end. The stock handlebar is very narrow. This makes for a compact fold, but has two drawbacks: firstly, the narrower the bar the more upright the riding position (which means it doesn’t so well suit large people); and secondly, the narrower the bar, the less leverage you have (which means it doesn’t so well suit the 2-speed model, which lacks low gears for spinning up hills). So, on goes a wider handlebar. And so far so good, because it just so happens that all I’ve had to do is plunder the spares box. But there’s one more modification: an extender stem. Step forward the Satori extension stem (about £18 via Ebay), which gives a couple of inches of reach. I needed to replace the brake cable (another dip into the spares box) because widening the bars and extending the reach both put the brake lever further away from the cable guide. But, wait! Now it won’t fold, because the handlebar just smacks into the fork, right? 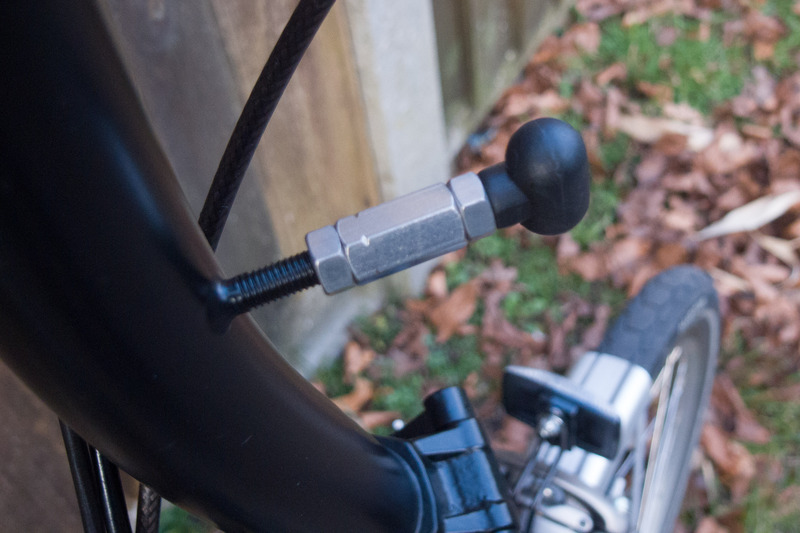 If you browse the web, most people solve this by replacing their stem bolt with a QR lever. But this adds another process to the fold, which I didn’t want. I hate faffing about with stuff when I don’t need to. So, here’s the cunning bit. What you can see there is an M6 barrel nut, with two standard M6 nuts either side of it to lock it in place. What you can’t see is a 20mm M6 grub screw, which screws into the plastic stub and into the barrel nut. This extends the plastic stub enough to allow room for the Satori stem when folded, and it folds without having to loosen the stem. 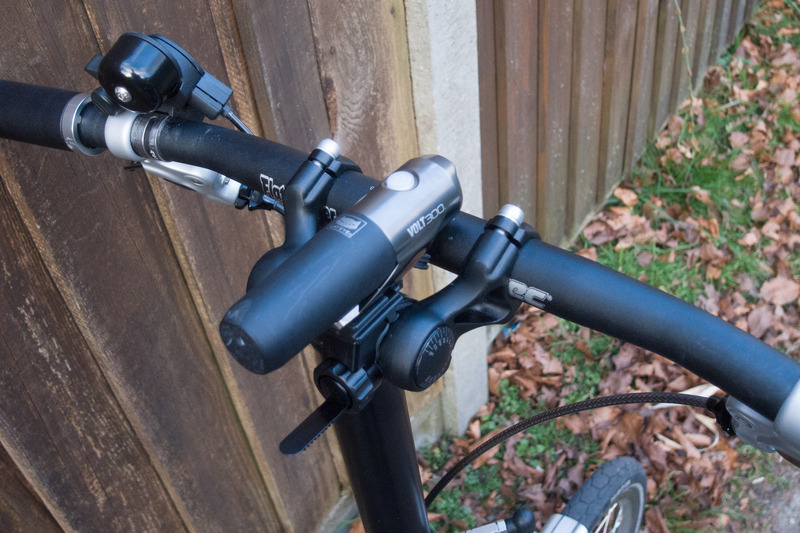 As an added bonus, it means I can just about mount that front light without it fouling the spokes when folded; and—even better—it means I can adjust the angle of the brake levers upwards a little to a more natural position. As you can see, it’s a little wider, but not enough to be an issue unless you have to squeeze it in somewhere particularly tight. The wider bars do stick out a little more, but again not enough to get in the way or touch the ground when folded and parked. I find I have to carry the folded bike by the frame rather than the saddle to avoid one end brushing the ground when walking, but that’s also because I don’t drop the top half of my seatpost, so the saddle’s rather higher that it would normally be. The result is a bike which feels much less like being perched on a bar stool, which steers a little less nervously, and which is much easier to pedal uphill with the two-speed setup. It may be a couple of inches fatter when folded, but that’s not a problem. All in all, it does the job quite nicely.